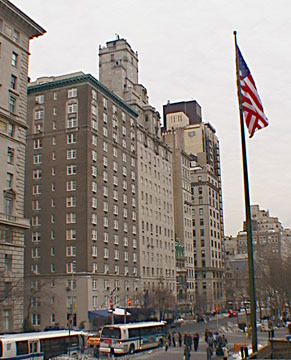 For decades this pre-war building designed by Rosario Candela was the only hotel property on the Upper East Side to challenge the desirability and prestige of the Carlyle Hotel on Madison Avenue. A far less interesting building architecturally, it did, however, face directly on Central Park and for many years it boasted an extremely attractive sidewalk café, probably the city's best on either side of its canopied entrance. The building was known as The Stanhope Hotel. Its conversion by Extell Development to a 26-unit condominium residence in 2007, however, did away with the café as well as its ground floor bar. The brown-brick building has a three-story limestone base and the sidewalk café has been replaced with hedges. When apartment sales languished initially, Extell dropped the "Stanhope" name. In the initial offering, one of the units had a price-tag of more than $47 million and the cheaper units could be had for about $11 million. Cetra Ruddy and John Simpson were the architects for the conversion. The 17-story building has a La Palestra health club, an in-house wine consultancy and Concierge Direct service. Apartment sizes start at a whopping 4,100 feet - eliminating most types of buyers except the very most exclusive. 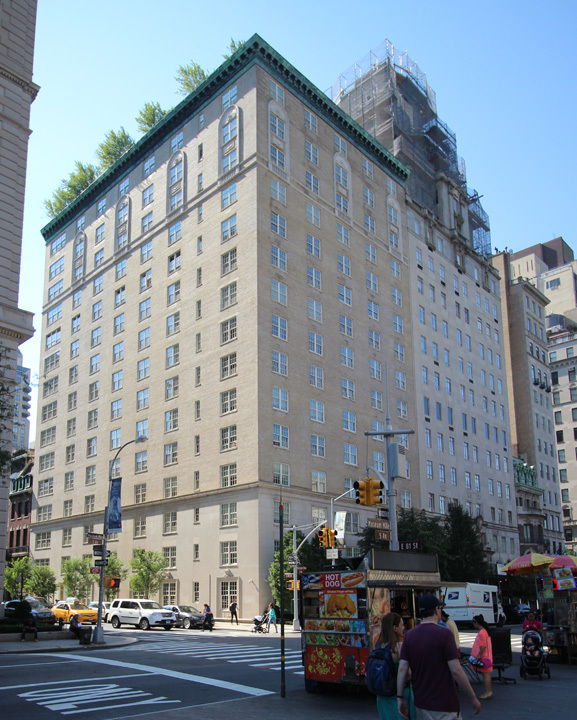 The building is across Fifth Avenue from the south end of the Metropolitan Museum of Art and across 81st Street from 998 Fifth Avenue, one of the city's most impressive pre-war apartment buildings.